Sub: CSE-APSSA- Amaravathi - Collection of UDISE Date for the year 2017-18 - Conduct of the Data Entry & Data Consistuency Communication of Guidelines and Financial Constitution of State/District Level teams- Reg. 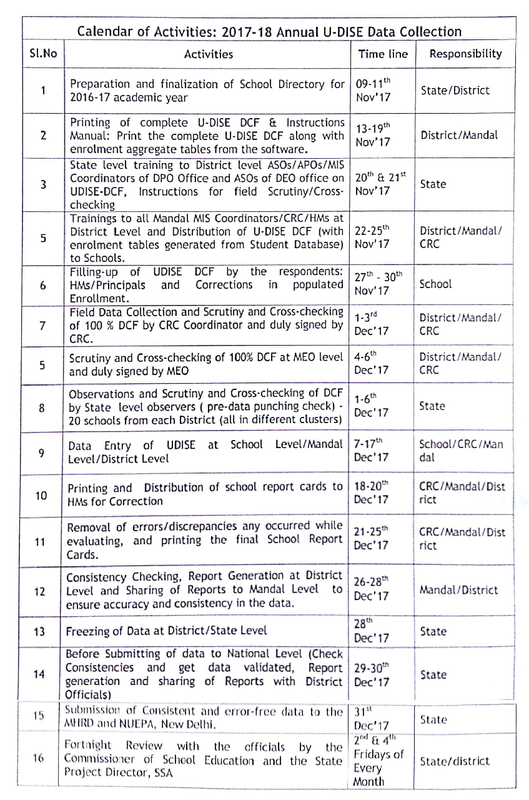 All the District Educational Officers and Project Officers of SSA in the state are informed that, the Schedule for UDISE 2017-18 Date Entry and Data Constitency checking at District Level has to be commenced from 09.11.2017 as per the following revised timelines. A Suitable accommodation shall be identified for data enty work. At least 2 to 4 computers shall be arranged at Mandal level for data entry work to complete within time schedule. It shall be ensured that both Data Entry Operator & Mandal MIS Coordinator has to complete the data entry within the stipulated time. At the time of data entry work in the Mandal level the concerned School Headmaster/CRP should present. The Budget may be utilized for Primary/Upper Primary from SSA funds and high schools/higher Secondary/ Junior Colleges from RMSA FUNDS. If planned budget is not sufficient under AWP&B 2017-18 the budget from management cost may be utilized.